The Kansas River (known locally as the Kaw) is a river in northeastern Kansas in the United States. It is the southwestern-most part of the Missouri River drainage, which is in turn the northwestern-most portion of the extensive Mississippi River drainage. Its name (and nickname) come from the Kanza (Kaw) people who once inhabited the area. The state of Kansas in turn drew its name from the river. The river valley averages 2.6 miles (4.2 km) in width, with the widest points being between Wamego and Rossville, where it is up to 4 miles (6.4 km) wide, then narrowing to 1 mile (1.6 km) or less in places below Eudora. Much of the river's watershed is dammed for flood control, but the Kaw is generally free-flowing and has only minor obstructions, including two diversion weirs and one low impact hydroelectric dam. Beginning at the confluence of the Republican and Smoky Hill rivers, just east of the aptly-named Junction City (1030 ft), the Kaw flows some 170 miles generally eastward to join the Missouri River at Kaw Point (730 ft) in Kansas City. The Kansas River valley is 138 miles long; the surplus length of the river is due to its meandering across the floodplain. This course roughly follows the maximum extent of the Kansan Glaciation, and the river likely began as a path of glacial meltwater drainage. The Kansas drains 34,423 mi² (89,155 km²) of land in Kansas (almost all of the northern half), along with 16,916 mi² (43,812 km²) in Nebraska, and 8,775 mi² (22,727 km²) in Colorado, making a total of just over 60,000 mi² (155,000 km²). Dropping only 320 feet on its journey seaward, the water in the Kaw falls less than 2 feet per mile. When including the Republican River, the Kansas River system has a length of 743 river miles, making it the 21st longest river in the United States. It highest headwaters are at about 6,000 ft and extend nearly to Limon, Colorado. Much of the drainage of the river lies within the Great Plains, but the river itself exists entirely within the Mid Continent Region. The majority of the rest of the state is drained by the Arkansas (and its tributaties, the Neosho, Cimarron, and Virdigris, all three of which drain into the Arkansas in Oklahoma). A portion of central-eastern Kansas is drained by the Marais des Cygnes River, which then flows into Missouri to meet the Missouri River. There is also a small area in the extreme northeast part of the state that drains directly into the Missouri. The Kansas river flows through what is known as the Stable Interior region. Since this region is near the center of the large North American Plate, it has not experienced any extensive faulting, folding, or mountain building during most of its geologic history. The age of the rock exposed by the river becomes progressively older as the river moves downstream for two main reasons. Firstly, downstream areas experience more erosion from increased waterflow, and secondly because of the slight uplift of the Ozark dome to the southeast. All of the rocks in the area are sedimentary, ranging from Late Pennsylvanian (300 million years ago) to recent, with three minor exceptions. The first is sands and gravel brought down from the Rocky Mountains which have settled in the western extents of the Kansas River basin. Secondly, the retreat of the Kansan Glaciation left behind a combination of ice- and meltwater-deposited sediments known as drifta, a poorly sorted mixture of clay, sand, gravel, and even large boulders that cover parts of the extreme eastern portion of the Kansas River basin. The third is loess, a fine silt that may have originally been deposited by the melting water of the receding glaciers, then redeposited by the wind. The thickest loess deposits can be found in the northwest and north-central part of the Kansas River basin from southern Nebraska into northwest Kansas, as well as near the river's mouth. Because of the river's shallow depth, slow drainage, high silt contents and proximity to industrial centers, the Kansas River was ranked as the 17th most polluted river in the United States. The first map showing the Kansas River is French cartographer Guillaume de L'Isle's "Carte de la Louisiane," which was drawn about 1718. On it the "Grande Riv[iere] des Cansez" flows into the Missouri River at about the 40th parallel. This map, with virtually no changes except for the translation of French into English, was subsequently published by John Senex, a London cartographer and engraver, in 1721. From June 26 through 29, 1804, The Lewis and Clark Expedition camped at Kaw Point at the river's mouth. They complimented the scenery and noted the area would be a good location for a fort. Native Americans, of course, used the river for transportation long before any Europeans knew of its existence. Their canoes, and the pirogues of the French fur traders, had a negligible draft and easily navigated the river at any water level. In August, 1819, Maj. Stephen H. Long steered the first steamer into the Kansas river with his 30-ton boat Western Engineer. He made it scarcely a mile up the river before turning back, citing mud bars from the recent floods. The mouth of the Kaw in the West Bottoms area of Kansas City (sitting at a longitude of 94 degrees 36 minutes West) was the basis for the Missouri's western boundary from Iowa to Arkansas when it became a state in 1821. (Kansas entered the Union in 1861.) South of the Missouri River, that longitude still remains the boundary between Kansas and Missouri. North of the Missouri River, the state of Missouri extended its boundary further to the west in 1836 with the Platte Purchase. The river has moved slightly since this designation, however the state boundary remains the same. This line is known as the Osage Boundary. From the 1840s through the early 1870s, the southern ridgelines of the lower section of the Kaw were the beginnings of the Oregon, California, and Santa Fe trails as they left Kansas City. Beginning in 1854, steamboats operated regularly from Kansas City to Lawrence and Topeka, and sometimes as far as Fort Riley. This traffic continued through the territorial period and the early years of statehood, falling off rapidly about 1860. The last steamer to travel the Kansas was the Alexander Majors, which was chartered in 1866 to run between Kansas City and Lawrence until the railroad bridge at the mouth of the river, which had been destroyed by floods, could be rebuilt. This traffic into statehood gave the Kansas legal status as a navigable stream in the eyes of the Federal government. In the 1860s, the country's goods were increasingly transported by the extensive and comparatively efficient railroad system. On February 25, 1864, the state legislature declared the Kansas River nonnavigable, allowing railroad and bridge companies to build bridges and dams without restriction. This law remained in effect until 1913, when, after it had been characterized as "a crime against the public welfare of Kansas," it was finally repealed and the river's status was restored to a navigable stream. The status has not since changed, though modern commercial navigation on the river is largely confined to dredging. Recreation along the Kansas River includes fishing, canoeing and kayaking, and rowing. There are 18 public access points along the river. The Friends of the Kaw organizes many float trips down the river each year (as well as cleanup efforts), and the Lawrence KOA rents canoes for self-guided trips. At least two rowing teams regularly use the river: The University of Kansas rowing team uses the pool above the Bowersock dam for their exercises, and the Kansas City Rowing Club rows in the final stretches of the river, near its mouth. Kansas City: A few hundred yards downstream from the I-435 bridge, a low weir diverts water to an intake for Kansas City. Lawrence: Bowersock Dam is the largest obstruction on the river. It serves not only to create a standing pool for one of Lawrence's municipal water intakes (the other is Clinton Lake), but also it creates a head for the Bowersock Mills & Power Company. At this site, the Bowersock Mills & Power Company operates the only hydroelectric power station in Kansas; a 2.5MW, Low Impact Hydropower Facility. The University of Kansas's rowing team also uses the pool for its exercises. Tecumseh: An easily navigable low head weir that diverts water to the Tecumseh power plant, just downstream from Topeka. 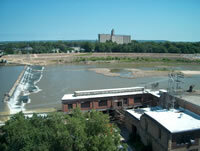 Topeka: A low weir diverts water to the south bank for a municipal water intake. The U.S. Army Corps of Engineers and the Bureau of Land Management operate many reservoirs within the watershed of the Kansas river for local and Mississippi River flood control, with secondary recreational uses.